Over the last couple of weeks, I've had the pleasure of travelling around the country talking to people living with disability as part of a nation-wide consultation on disability and the arts. Some of these people have been professional artists, some not. The discussion has been wideranging: How easy is it to access the arts if you have a hearing impairment or autism? What are the various organisations out there supporting people with disability to make art? And is the NDIS helpful or not when it comes to disability and creative expression? In one session, we asked people to consider the following question: "Why do we participate in the arts?" Everyone broke into small groups to spend a few minutes discussing this enthusiastically, writing their thoughts on paper. In the report-back session, I turned to the first group: Why did they participate in the arts? An emerging visual artist living with both physical and intellectual disability responded: "Because I love it. Because it brings me joy." There you have it. Nothing more to add. Because it seems to me that people living with disability are compelled to justify why they do what they do with their time based on a kind of "medical" or "therapeutic" framework. "I dance because it's a good form of physical therapy." "I do painting classes because it gets me out of the house." "I do music classes because it assists with some of the problems I am having with maths and reading." All of this is true of course. Research here and overseas has shown how early introduction to music, for example, can assist all people, living with disability or not, with cognitive development. Tapping out a beat may help children learn difficult fraction concepts. Numerous studies have found that dancing can improve balance, cognitive and fine motor performance in older people, as well as improving mental health. Other research shows that art therapy can help people with autism express emotions and open doors to communication. But justifying engagement with the arts only if it can be proven to make you a better student or a more productive worker seems too narrow. And it ignores the main reason why we create and express ourselves through art. Namely, as novelist Kurt Vonnegut wrote, the arts "are a very human way of making life more bearable". A few years ago, Elizabeth Gilbert, of Eat Pray Love fame, wrote a book on the human urge to be creative, Big Magic. There is a mystical aspect to her book (ideas float around in the ether and then whoosh down and plant themselves in the brains of people, much like the tormented spirits in a Ghostbusters film). You can take or leave that aspect of the book. But Gilbert argues compellingly that regardless of whether we are professional artists or not, we should all be encouraged to live our most creative lives and make time to be creative every day as a way to open up a world of wonder and joy. She is saying in her own way what Vonnegut argues. That creativity is a human right. If art is a way of making life more bearable, then for some of us — like people living with disability — the need to make art may in fact be more urgent. If you rarely see the stories you can relate to on our TV and cinema screens, or performed on our main stages or exhibited in our major galleries, then the need to make art that reflects your thinking and your reality becomes very important. Reflecting at the day-to-day life of my children at childcare and primary school, I've noticed how time spent doing art — music, dancing, painting and theatre — makes up the bulk of their day and a lot of their weekend. Then as they progress through formal schooling, this artistic experience either gets dropped in lieu of academic pursuits, or is "formalised", pushed into structured classes and exams. Only the most determined or talented continue past the teen years. After that there seems little time to be involved making art. 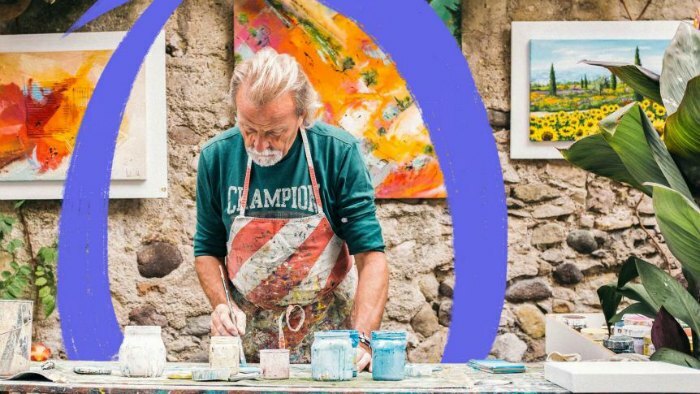 But I've noticed in research with older Australians — 60-plus — how they are returning or even starting to make art for the first time. A just-retired man begins harmonica lessons. A grandmother returning to ballet for the first time in 40 years. And it's almost become a cliche that women my age dream of starting a ceramics or pottery class some time in the near future (that scene from Ghost really did a number on us). Art for art's sake. No matter what age, gender or ability. Just for the love of it. Dr Rebecca Huntley is one of Australians foremost researchers on social and consumer trends. She has a background in publishing, academia and politics. She holds degrees in law and film studies and a PhD in Gender Studies. For nearly 9 years Rebecca was the Director of The Mind & Mood Report, Australia's longest running social trends report, founded by Hugh Mackay. She is the author of numerous books - The World According to Y: Inside the New Adult Generation, Eating Between the Lines: food and equality in Australia. Read more. If you would like to learn more about Dr Rebecca Huntley's keynote presentations click here, or contact us for further information call 1300 55 64 69.